Exfoliation is best way to avoid ingrown hairs. Recently, I had a gentleman ask “Have you ever tried to wax with exfoliation versus without exfoliation? For example, waxing one leg with exfoliation and one without to see the result.” What a great question! (For more Waxing Q&A’s, click here!) While I have not had the same customer try exfoliating one leg and not the other to see what would happen, I have experienced this in general with customers who suffer from ingrown hairs. During a waxing appointment, each individual hair will be pulled from the root. As a result, a brand new baby hair will grow back in. Since this is a new hair, it will be softer and finer than a hair that has been shaved. 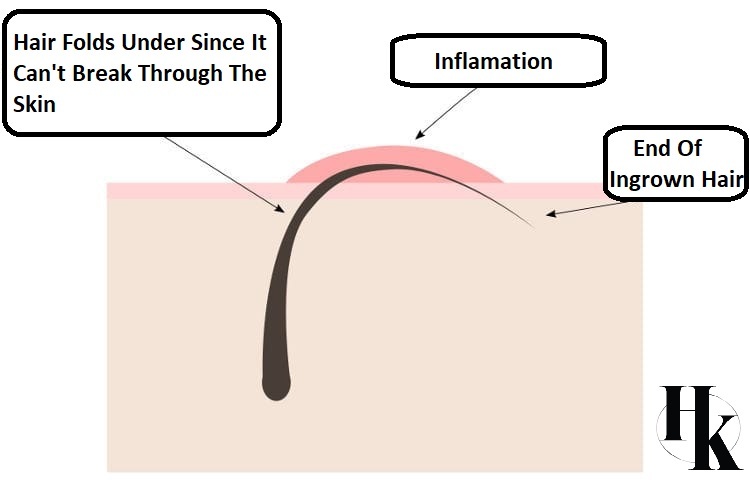 Because of this, sometimes it can be harder for that fine hair to push through the skin, causing it to turn back under the skin and result in an ingrown hair. This is where exfoliation comes into play! How Does Exfoliating Work After Waxing? Exfoliating will get rid of that top layer of dead skin that can block those softer hairs from surfacing. In order to do this, either use some kind of scrub, an exfoliating glove, or even just a small towel to rub against the area. We also recommend using PFB Vanish after a shower to help get rid of dead skin cells and lift any stuck hairs underneath the skin. For more information on post wax care, click here. Is Exfoliating Really That Important? Yes! While I have not had the same customer try exfoliating one leg and not the other to see what would happen, I have experienced this situation in general. I always have customers that will not exfoliate in-between waxing appointments no matter how much I beg them. I also have customers who always exfoliate in-between waxing appointments! It is very easy to tell the difference between those who exfoliate and those who don’t simply how the hair responds. My customers who don’t want to exfoliate will have more ingrown hairs; issues with the hair not poking through the skin correctly and having excess dead skin on top. While my customers who always exfoliate will have perfect waxes and don’t have to deal with ingrown hairs or the hair not coming out. Lesson learned, exfoliate!